The hills, it appears, roll on south and west forever. From any stretch of road we drove down on our recent family holiday to northern Spain there was an unbroken range of the greenest of rolling hills. On clear days the Picos de Europa mountains loomed in the distance. If gazing at this graceful greenery palled then there was the deep blue of the Bay of Biscay in summer to offer a contrast. So explain to me again why so many of our fellow passengers on the Portsmouth to Bilbao ferry were charging south, to the overcooked Mediterranean coast? Not that we minded. Portsmouth had been a pleasure: the new home for the Mary Rose alongside HMS Victory at the city’s Historic Dockyard the perfect way to while away the day before our crossing. It was reminder that even less heralded parts of England contain shake-inducing wonders. The Brittany Ferries crossing was another treat with lots of family-friendly features including a heated outdoor swimming pool and a kids play area. Whales were easily spotted when nearing Spain and cetacean-spotting volunteers were on hand to sort a blowhole from an over-enthusastic wave. If, like mine, your children are fanatical about Octonauts then they’ll go bananas at any marine life. You’ll probably also discover that your three-year-old knows more about whale behaviour than you do. Nonetheless arriving in Bilbao was exciting and, due to the resolutely industrial nature of the port, a little foreboding. 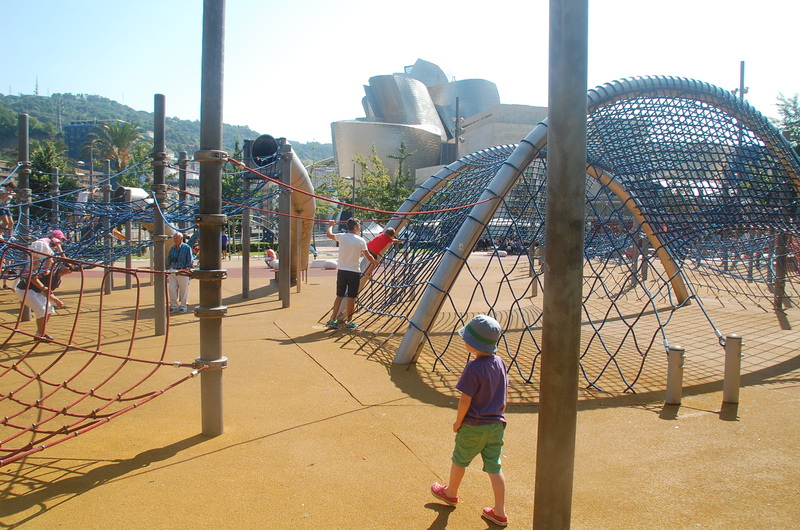 There was no need to fret – nor to pigeonhole Bilbao, which has a very pleasant centre and, of course, the Guggenheim. And – here a theme begins to develop – a rather spiffy playground round the back complete with towering tunnel slides. Trams too! Our destination was Noja (no-kha), a seaside town between Bilbao and the other ferry port on the north coast, Santander. Noja is there due to its beach and attracts a largely Spanish crowd to its shores. The unfamiliar language we heard everywhere was Basque, underlining the local crowd here along with a smattering of Brits, Dutch and French visitors. We were there in peak season and our campsite, the leafy and lively Playa Joyel, was full. Thumbs up for this place – great pools, lots of suggestions for things to do, a nature reserve and it was steps from a wonderful strand of sand with body-surfable waves. If you don’t have a tent you could do what we did and stay in one of the on-site bungalows. The dazzling array of camping gear from across Europe provided ample eye-candy for travel gear nerds. It takes one to know one. That said, even the best campsite and pool will induce a need to get out and explore, and Cantabria, the province we were in delivered the goods. 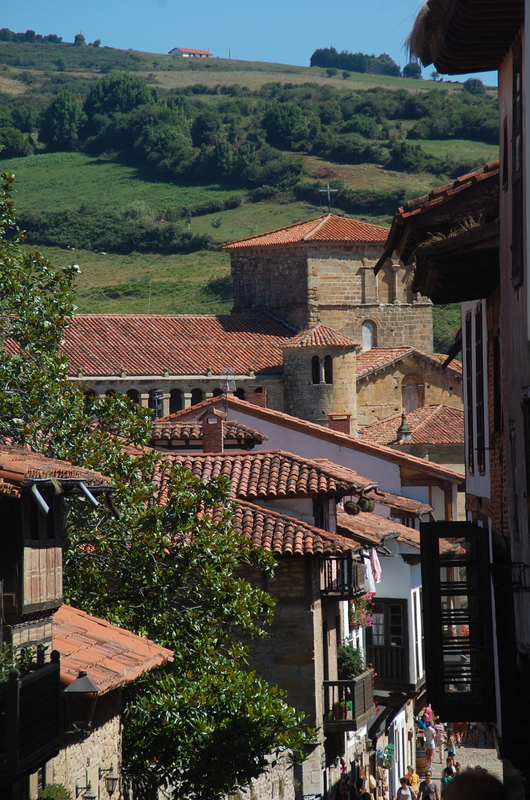 On one day we visited Santillana Del Mar, a beautifully-preserved medieval town. It must be superb on a wintery day and in the evening, but retained charm even on a busy summer Saturday. Further on down a beautiful road that wouldn’t have looked out of place in the French Jura was Comillas, with a great beach and a variety of modernist buildings. Small Halls revolted at the notion of hill-climbing to Gaudi-designed houses, so we compromised on an ice cream in town and a quick look at a Gaudi gatehouse on the way to the seaside. Another excellent jaunt was to the caves of Monte Castillo, containing the kind of rock art parts of France are famous for. Booking is necessary both for the El Castillo and Moneda caves, and well worth it. We were late for our booking but were accommodated on a later tour of the other cave – allow an extra half hour to get there as even once you park it is a chunky walk, especially for kids, to the visitor centre and further on to some of the caves. The views of Puente Visego below are superb. Other treats? 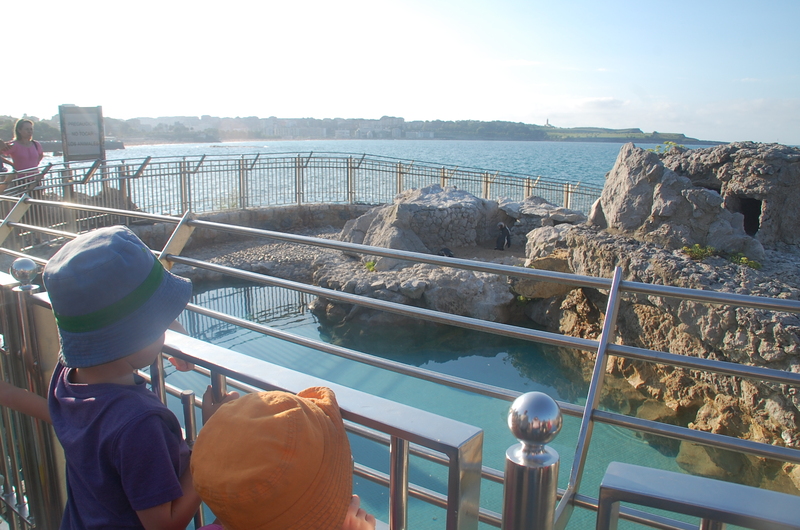 Santander on a sunny Sunday evening, especially pottering around the park on the Magdalena Peninsula. It was a challenge to find a parking space, but as we walked back from in the setting sun the harbour view rivalled some of the world’s great waterside scenes. Saying it beats Sydney is a stretch, but Santander simply offers views that need seeing. After a week I would have loved to up sticks and head west, to Asturias and Galicia, following the trail of the Camino Santiago signs and sweaty yet beatific hikers we saw on smaller roads, or east back to the Basque country to San Sebastian and into the Pyrenees, but that’s for another time. Put simply, if you are looking for a slice of real Spain, and to holiday with Spanish people there, then the green hills of Cantabria make for a memorable choice.